The Garden Skink is the most common skink found in suburban gardens around Victoria, Australia. It is found over most areas of the state except the semi arid northern and western regions. It lives in a variety of treed habitats. The long body part of a skink looks more like a snake than a Lizard but they have very small legs and a head that is slightly off the ground and pointed upwards. 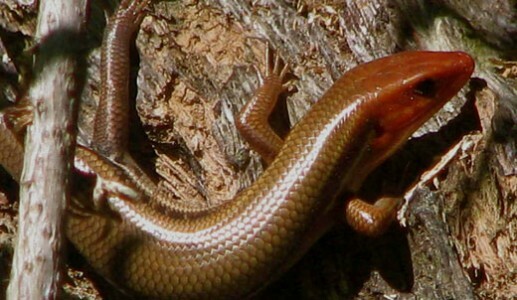 The Garden Skink usually has a browny black colour and sometimes may appear a dark shade of red when bathing in the sun. As all reptiles are cold blooded, skinks can be seen on top of rocks or paths in the morning trying to warm their blood. The Garden Skink’s predators are mainly birds. Even tiny birds like robins are a threat to skinks. Like many other skinks, its tail will drop if grasped roughly. The disconnected tail will twitch vigorously for a while, capturing the attention of the predator while the lizard makes its escape. Although this may cost the skink some energy, the skink’s tail will eventually grow back. The Common Garden Skink lays small, white eggs between summer and mid autumn. The female usually lays about four eggs, often in communal clutches that may contain as many as 250 eggs altogether, usually under a cluster of rocks to keep them safe from predators. The eggs hatch in a matter of weeks after they are laid. Habitat: Open woodland and forest. Common in suburban gardens. Range: Southeast Queensland through eastern New South Wales and Victoria and into south eastern South Australia.